Sitting in his office back in January, Franconia founder Dennis Wehrmann said he wanted to do something different. A face-lift for the brewery would be a part of it, along with the staggered release of a series of special anniversary brews. Off-the-grid and off-the-map was the message that day, and as he outlined his plans for the months ahead it was clear it was going to be a landmark time for a brewery poised to celebrate its fifth year in existence. Going off-the-grid meant taking Franconia's sustainability commitment to unprecedented levels. Still a work in progress, it began by making the bier from herePerfectly Green. Construction of a power delivery system and solar carport was completed in February, which resulted in the brewery having the ability to supply 100% of its own electricity. Now pending is a new phase, tentatively scheduled to break ground in October, which would add a beer garden along the west side of the property. Harnessing additional solar and possibly thermal energy, it will allow the brewery to sell electricity back to the power company. The expanded outdoor space will be a welcome addition, especially when you consider things happening inside the brewery. Walk through the door today and you'll notice a little less indoor elbow room. That's because roughly a quarter of the interior floor space has been taken up by a newly delivered bottling system. 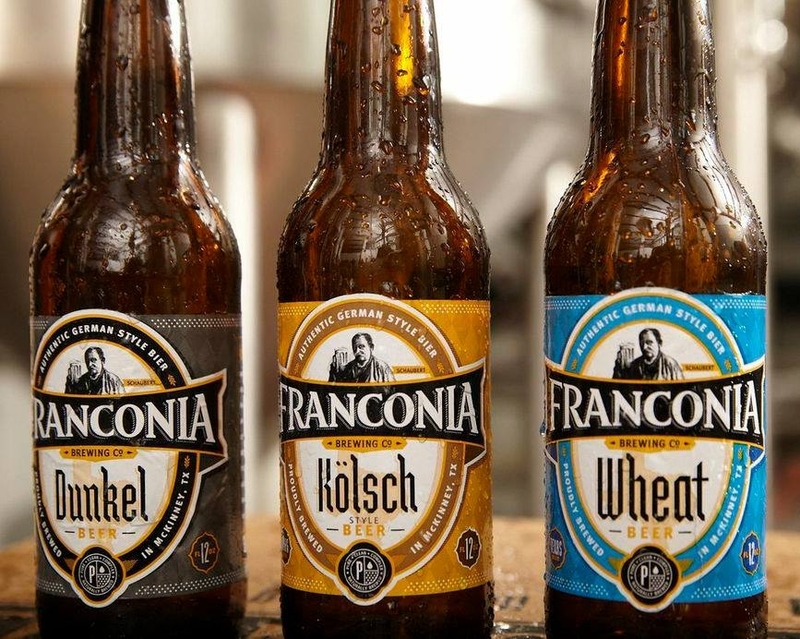 Yes, at long last, Franconia is bottling their beer. The 20-head system, built by the Italian company Comac, can process upwards of 5400 bottles per hour. With it they'll package their Kölsch, Wheat and Dunkel to start, perhaps adding Franconia Lager by the end of 2013 and seasonals sometime next year. Naturally, Franconia's line of anniversary beers will not be bottled. These small-batch brews will continue to be draft-only and available in very limited quantities. But, here's where the off-the-map aspect comes in to play. Loosening his grip ever so slightly on long-held German tradition and the guidelines of the Reinheitsgebot, Wehrmann launched this series with an Oatmeal Stout (oats being a deviation from the purity law) and a Double IPA (brewed with exclusively American hops). Next up will be McKinney Champagne, a high gravity wheat beer fermented with French champagne yeast. It has an elevated ABV, but is remarkably easy to drink with a refreshing effervescence and distinctive wine-like quality. Look for it to arrive at seasonal accounts starting this week. As for what's still to come, how does a smoked hefeweizen sound? The impetus for all this is the aforementioned fifth anniversary, something the brewery will celebrate officially on August 17 at Kelly's at the Village in Allen. They'll pair with them on the occasion of that establishment's first year in business for a joint celebration starting at 2 p.m. It'll be your last chance to try the Oatmeal Stout, as well as last year's limited release Sarah's Darkside. Advance tickets can be purchased for $5 at Kelly's, which will guarantee you a pour from the first Oktoberfest keg of the season and a Kelly's souvenir logo glass. Summing up all of this change, Wehrmann's brewery would seem to be positioning itself for an expanded presence in the marketplace. Having products available at retail will certainly help. Think of it this way. 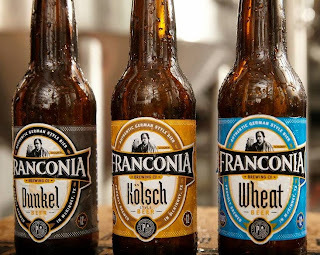 Now, if someone says they're not familiar with Franconia, you can crack them over the head with a bottle. Figuratively speaking, of course.